TJ Max is one of my favorite stores. It seems to have a little of everything -- from scarves and bags . . . to sneakers and skirts . . . to dutch ovens and bedsheets. There's food, too, but I rarely venture down that aisle. I mean, really? Food? I'm sure it's all just super old castoffs from grocery and specialty store shelves across the country. And that's just gross. Most of it is processed like crazy, too. Moose munch? Chocolate covered cherries? Powdered margarita mix? Please. The food aisle at our TJ Max must have been moved recently. For, when I made a quick trip there after work the other day, I somehow found myself elbow deep in oils and spices. There was indeed some cool stuff there, and I sort of wish I had given the place a chance sooner. 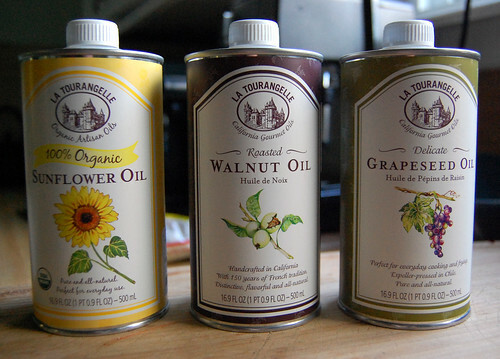 Half off fancy, organic oils -- sunflower, grapeseed, and walnut -- is definitely a deal. 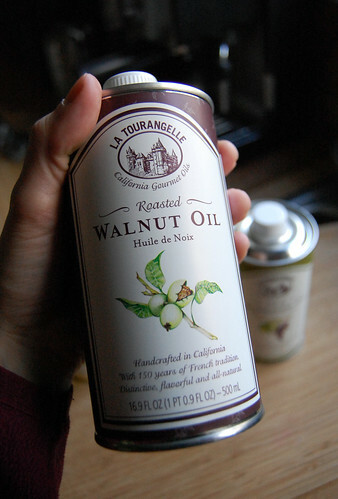 Walnut oil is my favorite of the three. As the name suggests, it is a light and nutty oil most suitable for using in dressings and dips. It's an excellent source of omega-3 fatty acids (without the fish gelatin added in, thank you! ), which we all know is essential to our nutrition. However, if you plan to rush out an get some of your own, be careful. We learned last night that using walnut oil at high temps doesn't work (think pops-up-and-burns-you-in-the-face doesn't work). Instead, stick to using it at room temperature or for a medium heat saute. It not only loses its flavor when exposed to high heat, its nutrients and antioxidants break down, too. 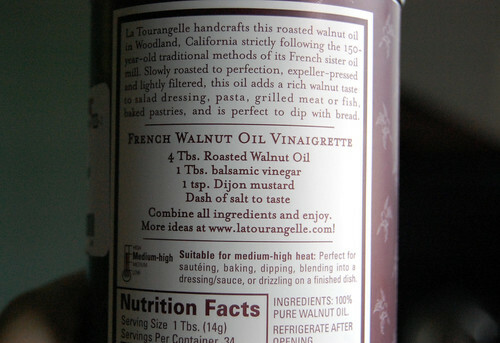 There's a great recipe on this particular bottle for a French Walnut Oil Vinaigrette we just can't wait to try out. We used some of it to make a succulent sauce for a stir-fry. It's simple and healthy. Fancy and free. OK. Not free, the oil did set us back about $6 a pop. However, I'm used to seeing prices double that amount on like products. It's well worth a little cash. 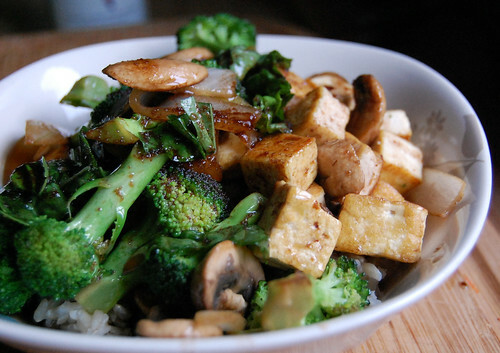 To make this dish, just use a bit of olive oil to stir-fry some veggies (here we're used broccoli, onion, mushroom, and tofu). Then in another bowl, mix together equal parts walnut oil and balsamic vinegar. Add some garlic powder, mix, and spoon over veggies. Oh, yeah. We added some freshly chopped basil for an extra punch. I'd highly suggest including that in your own version.